Captures and displays complex waveforms, random events and subtle patterns in actual signal behavior. DPOs provide 3 dimensions of signal information in real time: Amplitude, time and the distribution of amplitude over time. High frequency and random glitch capture. Captures glitches as narrow as 1 ns (typical) using acquisition hardware at all time base settings. Monitors the incoming signals on all channels and alerts the user to any waveform that deviates from the normal waveform being acquired. Conventional level-driven trigger. Positive or negative slope on any channel. Coupling selections: AC, DC, Noise Reject, HF Reject, LF Reject. Trigger on specific lines in broadcast and non-broadcast (custom) standards and on analog HDTV formats (1080i, 1080p, 720p, 480p). Requires TDS3VID or TDS3SDI application module. Trigger on pulse edge rates that are either faster or slower than a set rate. Edges can be rising, falling or either. Any logic state. Triggerable on rising or falling edge of a clock. Logic triggers can be used on combinations of 2 inputs (not 4). Provides isolated pulse triggering required to perform DS1/DS3 telecommunications mask testing per ANSI T1.102 standard. Requires TDS3TMT application module. Mean, Min, Max, Standard deviation. Requires TDS3AAM application module. Integrate, Differentiate, Define extensive algebraic expressions including analog waveforms, math functions, scalars, up to two user-adjustable variables and results of parametric measurements. For example: (Intg (Ch1-Mean(Ch1)) x 1.414 x VAR1). Note: Requires TDS3AAM application module. Meets or exceeds EN61326 Class A, Annex D radiated and conducted emissions and immunity; EN6100-3-2 AC Powerline Harmonic Emissions; EN6100-3-3 Voltage Changes, Fluctuation, and Flicker; FCC 47 CFR, Part 15, Subpart B, Class A; Australian EMC framework. *1 Requires TDS3AAM application module. Enables fast and easy communication between Windows PC and the TDS3000C series via LAN, GPIB, or RS-232. 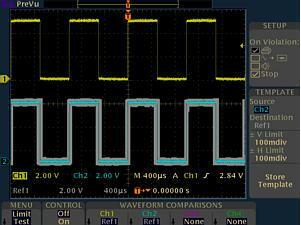 Transfer and save settings, waveforms, measurements and screen images. A fully interactive measurement software environment optimized for the TDS3000C series. Enables you to acquire, generate, analyze, compare, import and save measurement data and signals using intuitive drag-and-drop user interface that does not require any programming. Standard TDS3000C series support for acquiring, controlling, viewing and exporting your live signal data is permanently available through the software. A 30-day trial period of the full version provides additional signal processing, advance analysis, mixed signal, sweeping, limit testing and user-defined step capabilities. Order SIGEXPTE for permanent full version capability. Advanced Analysis Module. Adds extended math capability, arbitrary math expressions, measurement statistics and additional automated measurements. Limit Testing Module. 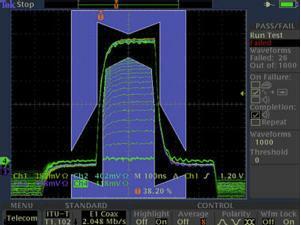 Adds custom waveform limit testing capabilities. Telecom Mask Testing Module. Adds pass/fail compliance of ITU-T G.703 and ANSI T1.102 standards, custom mask testing and more. Extended Video Analysis Module. Adds video quickmenu, autoset, hold, line count trigger, video picture mode, vectorscope*2 mode, HDTV format trigger graticules and more. Serial/Digital Video Module. Adds 601 serial digital video to analog video conversion, video picture, vectorscope*2, and analog HDTV triggering capabilities and more. Extensive instructions and step-by-step lab exercises provide education about the operation of TDS3000C Series Oscilloscopes. Kit includes self-paced CD-ROM based manual and signal source board. Optional hard copy manual available for order separately. *2 Vectorscope does not support composite video. The TDS3000C Series digital phosphor oscilloscopes (DPO) provide you with the performance you need at a price you can afford. Bandwidths range from 100 MHz to 500 MHz, with up to 5 GS/s sample rates for accurate representation of your signal. To solve a problem, first you need to see it. The TDS3000C Series combines 3,600 wfms/s continuous waveform capture rate and real-time intensity grading so you can see the problem and solve it. Fast waveform capture rates on a continuous basis save time by quickly revealing the nature of faults so advanced triggers can be applied to isolate them. 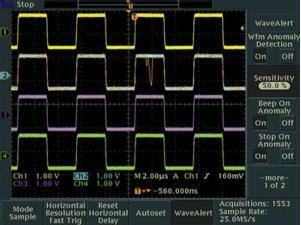 Real-time intensity grading highlights the details about the history of a signal’s activity, making it easier to understand the characteristics of the waveforms you’ve captured. 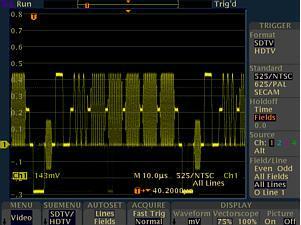 Unlike other comparable oscilloscopes, the history remains even after the acquisition is stopped. The TDS3000C Series combines unique digital real-time (DRT) sampling technology with sin(x)/x interpolation to allow you to accurately characterize a wide range of signal types on all channels simultaneously. With the TDS3000C Series there is no change in sampling rate when additional channels are turned on, unlike other comparable oscilloscopes. This sampling technology makes it possible to capture high-frequency information, such as glitches and edge anomalies, that elude other oscilloscopes in its class, while sin(x)/x interpolation ensures precise reconstruction of each waveform. 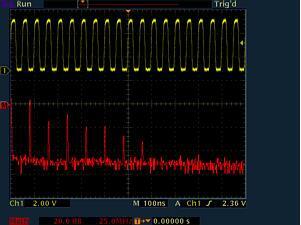 Look for unintentional circuit noise with the TDS3000C Series’ FFT capability. Custom video triggering allows the TDS3000C Series to trigger on standards such as RS-343 (26.2 kHz scan rate). The TDS3000C Series provides breakthrough test speeds for telecommunications line card testing. The telecom QUICKMENU puts all the commonly used telecom test functions on a single menu. The TDS3000C Series with the TDS3LIM module is ideal for manufacturing test applications where fast Go/No-Go decisions are required. WaveAlert waveform anomaly detection alerts you to any waveform that deviates from the “normal” input such as the glitch on channel 2. 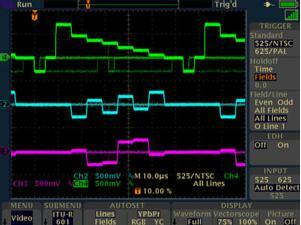 When working under tight deadlines, you need your oscilloscope to be intuitive; you want to minimize time spent learning and re-learning how to use it. The TDS3000C Series oscilloscopes help reduce your learning curve. Simple navigation and dedicated front panel controls get you to where you want to be quickly, so that you spend less time learning and more time on the task at hand. The TDS3000C Series comes equipped with a USB host port so you can easily store and transfer measurement information to your PC. OpenChoice® PC Communication Software allows you to simply pull screen images and waveform data into a stand-alone desktop application or directly into Microsoft Word and Excel. To complement OpenChoice, National Instruments LabVIEW SignalExpress™ Tektronix Edition Software provides you with extended capabilities including advanced analysis, data logging, remote instrument control and live waveform analysis. If you prefer not to use a PC for analysis, the TDS3000C Series comes standard with 25 automatic measurements, waveform add, subtract, divide, and multiply math functions, and Fast Fourier Transform (FFT). Unlike other comparable oscilloscopes, the TDS3000C Series math and measurement allows you to use the full acquisition record length or isolate a specific occurrence within an acquisition. Easily transfer, document and analyze data on your PC. The TDS3000C Series packs the power of a DPO in a compact design that is only 5.9 in. (149 mm) deep, freeing up valuable bench-top space. And when you need to move your oscilloscope to another lab, its portable 7 lbs (3.2 kg) design makes for easy transport. If your work demands even more mobility, then the optional battery pack will give you up to three hours of operation without line power. TDS3BATC provides you with up to three hours of portable battery operation. Tektronix TDS3AAM Módulo de Análisis Avanzado, para los osciloscopios TDS3000. Tektronix TDS 3 Máscara TMT Telecom Módulo de Aplicación, para los osciloscopios TDS3000. Tektronix TDS3VID Vídeo extenso módulo de aplicación, para los osciloscopios TDS3000.